Seated in the 26th-floor conference room in the headquarters of Japan's biggest publisher, Kodansha Ltd., the renowned Japanese manga artist Kenshi Hirokane, creator of the Kosaku Shima comics series, talks on and on, unable to stop. At 66, Hirokane is the same age as his fictional character portrayed in the series (a "salaryman" who rises through the ranks of a Japanese corporation). As he peers out the window above Tokyo's calm cityscape, Hirokane's thoughts well up irresistibly inside him. "It's like 'The Tortoise and the Hare.' Japan is the hare, becoming complacent when it thinks it has a big lead. But then it discovers that South Korea is the tortoise, which has run so far ahead that it's out of Japan's sight. That's what Japan is facing right now," Hirokane says. Over the past two years, Japan's benchmark corporations, such as Panasonic, Sony, and Sharp, have posted record losses, and their decline has perturbed Hirokane, who worked for Panasonic Corp. (known then as Matsushita Electric Industrial) for three years after graduating from Waseda University and has a deep emotional bond with these once-great enterprises. "Japanese companies need to change," he says, a thought reflected through the protagonist of his manga series. Kosaku Shima typifies the post-World War II rise of corporate Japan. Like Hirokane, he graduated from Waseda University and then went to work for a huge conglomerate patterned after Matsushita Electric called Hatsushiba Electric. As the series progresses, Shima gets promoted from section chief up the corporate ladder to president, and he was made chairman of the board this August. Shima's journey offers insight into the workings of corporate Japan and bears witness to an age when Japan's economy was at its peak. Japan's Ministry of Foreign Affairs often gives the English translation of the Kosaku Shima series as a gift to visiting dignitaries to help them better understand how Japan's economy and corporations work. In May, Japanese broadcaster NHK collaborated with Hirokane to bring the series, which has sold more than 40 million comic books, to the big screen, producing its first-ever animated economic documentary called Kosaku Shima's Asian Entrepreneurs. In the film, Shima, symbolizing Japan's great tradition, leaves his country on a trip of discovery to other parts of Asia. Hoping to learn about different commercial models, he visits such leading entrepreneurs as TSMC chairman Morris Chang, Haier chairman Zhang Ruimin, Far East New Century chairman Douglas Hsu, and Air Asia CEO Tony Fernandes – all portrayed as animated characters. The horizontal business model Morris Chang has built in the semiconductor industry is one of the examples from which Shima's vertically integrated Japanese electronics firm hopes to learn. Japan was once the leader of the pack in the "flying geese model" of East Asian development (the process of regional economic stimulus through technology transfer), enabling Taiwan and South Korea to follow its development track. But during Japan's "lost 20 years," its once dominant companies have seen their fortunes decline as well. That NHK would choose this moment to portray a classic Japanese company-man character like Kosaku Shimu shifting his gaze from the West back to Asia to learn from regional companies reflects a reality of far-reaching significance. "I've always wondered how other Asian countries were able to grow at such a fast pace during Japan's lost 20 years," says Shimbi Suzuki, the 50-something executive producer at the NHK Programming Department's Content Development Center. Suzuki, who was the driving force behind NHK's first animated economic documentary, has traveled throughout Asia to produce special reports for NHK and seen its rise first hand. Five years ago, he was in Shanghai for the first time for Uniqlo's grand opening. Standing amid the city's towering skyline, Suzuki was mesmerized by China's explosive growth. On subsequent trips, he would visit big electronics marts only to find that the most prominently positioned counters were selling the products of South Korean brands Samsung and LG, and even Chinese brands were outselling Japanese goods. He was forced to honestly confront this harsh reality. "The Japanese people still do not have a sense of crisis. They still can't accept the truth that they are no longer No. 1 in Asia," Suzuki says. Korean, Chinese and even Taiwanese companies have relied on pragmatism, speed, and flexibility to grab bigger shares of the global market, qualities that conservative and rigid Japanese enterprises desperately need to adopt. Japan's leading business newspaper, the Nikkei Shimbun, said recently that Japan's companies have reached a historical crossroads and will be supplanted by a new generation of Asian companies if they do not watch out. The best examples are the electronics companies that were once a major source of pride for the Japanese. In the 1970s and 1980s, Japanese enterprises were the dominant vendors of memory chips, color TVs, video recorders and portable audio cassette players. In more recent years, however, they have repeatedly fought losing battles against Apple and Google and even fallen behind Samsung and LG. That decline has exposed structural problems that have been building up for years. First, Japan's sizable domestic market has led Japanese companies to be predominantly inward-looking isolated islands. "Japan is like the Galapagos Islands in Darwin's Theory of Evolution," Hirokane says, explaining that because the Galapagos are geographically isolated, they have unique ecosystems and wild species, such as the giant tortoise, found nowhere else in the world. The same can be said of today's Japan, the manga artist contends. 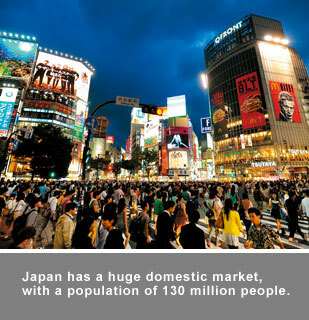 "Japan has a vast market of 130 million people, so Japanese companies have not thought about expanding their reach abroad. 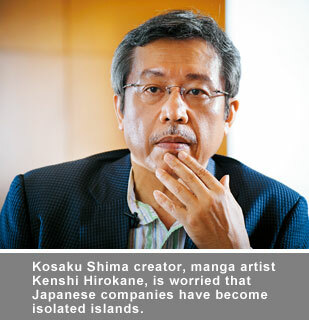 Over time, Japan has turned into an isolated island cut off from the world," Hirokane says. In the 30 years he has worked on his Kosaku Shima series, he has offered profound insights into Japanese companies and feels particularly strongly that they lack the will to venture overseas in pursuit of success. This isolated island syndrome has been most evident in the smartphone market. Journalist Tsuyoshi Nojima, who shuttles among Taiwan, Japan and China covering business and industry news for the Asahi Shimbun, pulled two smartphones out of his pocket to illustrate the point. In his right hand was a traditional clamshell handset, a product promoted by Japan's biggest telecom operator NTT Docomo called the au. "Ten years ago it was a very advanced cell phone, but now it's behind the times and only used in Japan. Everyone bashes it now as an 'isolated island cell phone,'" says Nojima, noting that the only reason he holds on to it is to keep his phone number. The Samsung smartphone in his left hand is the phone he actually carries with him when he is working or goes overseas. Japanese vendors were well aware of the iPhone's ascendance and even discussed whether to develop their own smartphones. "But when they thought about how big Japan's market was, they decided to cling to their clamshell models, leaving the smartphone market to be seized by Apple's iPhone and Samsung," Nojima says. At the same time, while Japan's "artisanal spirit" – the relentless pursuit of perfection and technology – has been a source of Japanese pride and ensured the high-quality level of Japanese-made goods, it has also been a major accomplice in the decline of the country's top companies. In an analysis of the factors holding Japanese companies back as they posted record losses, Japan's Ministry of Economy, Trade and Industry said the biggest problem was complicated specifications that led to delays in getting new products to market, costing vendors opportunities. "Japanese companies had had too much confidence in their technology and manufacturing and forgot to think about products from the consumer's point of view," Panasonic President Kazuhiro Tsuga conceded in June 2012 after announcing the company's biggest loss since 1994. In the LCD TV field, for example, Sony introduced the world's first LED-backlit LCD TV in 2004, a year earlier than Samsung. But today Samsung has more than a 50 percent share of the North American market because of its high performance-to-price ratio, while Sony long ago fell out of the top five. Sharp, meanwhile, developed the most advanced LCD panel technology but was unable to sell its products in large quantities overseas, leaving it teetering on the brink of bankruptcy at one point. Equally problematic is the difficulty Japanese companies will have if they want to reorganize their operations. Chihiro Suematsu, a professor in Kyoto University's Faculty of Economics, observes that the corporate governance philosophy in Japan's traditional conglomerates stresses making decisions by consensus. This collective approach has spawned a lengthy and exhaustive decision-making process that leaves top executives without the power to make snap decisions. "In this era of globalization, where the market and technology change at a fast pace, (Japanese companies') reactions are too slow," Suematsu says. "In successful companies in Taiwan or China, the leaders are all entrepreneurs and have stronger leadership," Suematsu says, referring to the roles played by many of the Asian leaders the manga character Shima visits in the NHK documentary, including Morris Chang and Zhang Ruimin. Suematsu says that when you look at the most dynamic companies in Japan today, such as e-commerce giant Rakuten Inc., telecom provider Softbank Corp., and apparel retailer Uniqlo, none of them are traditional companies. 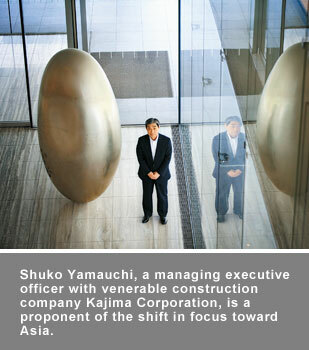 They are all new-generation Japanese enterprises led by people with particularly strong leadership styles. Unwilling to be supplanted by new-generation Asian upstarts, Japan's companies are busy building new relations with Asia. Chiang Pin-kung, the chairman of the Taiwan Institute of Economic Research (TIER), observes that Japan has already launched a 2.0 version of the "flying geese model," which involves a new emphasis on "re-engaging with Asia after shifting away from Asia toward the West in its early years." The new orientation is reflected by the latest figures on Japanese companies' accelerated efforts to move into Southeast Asian markets, including Vietnam, Cambodia, Myanmar and Laos. In the first seven months of 2013, Japanese enterprises spent US$8.2 billion on mergers and acquisitions in Southeast Asia, already surpassing the historical high for a full year of US$7.6 billion in 2006 and far exceeding the US$614 million invested during the same period of 2012, according to global deal tracking firm Dealogic. More than anti-Japanese sentiment in China is behind the shift south. Japanese companies hope to rebuild their global industrial stature by deepening their presence in the rapidly growing Asian market. But what exactly will this new Asia-Japan relationship entail? In the past, Japanese enterprises relied on a vertically integrated model – producing everything in-house, from components to finished products – to maintain their roles as the leader of the flock in the "flying geese model." To many of those companies, "division of labor" was a completely alien concept. In Kosaku Shima's Asian Entrepreneurs, Shima brings his subordinates to TSMC's plant in Hsinchu to get an understanding of its horizontal business model, revealing the recent shift in the attitude of Japanese companies to shut down the isolated island and open the door of cooperation. Sitting in his office in a calm alley near the huge Tokyo Midtown complex, former Sony CEO Nobuyuki Idei ponders the future of Japan and its corporations and echoes the message conveyed in the NHK production. "Japan should open its doors wider to Asia and develop partnerships based on equality and collaboration," he says with conviction. 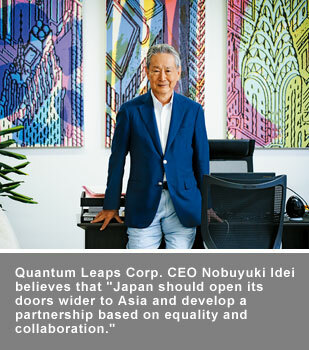 Idei, who is now the CEO of management consultancy Quantum Leaps Corp., believes Japan's manufacturing technology remains the best in the world, and sees Japan's high-speed trains and energy-saving solutions as among the items needed by rapidly developing Southeast Asian countries at this moment. Among the examples cited by Idei: Japan's Shinkansen (high-speed rail) will bid for a contract in India, and construction company Kajima Corporation is in Indonesia working on basic highway infrastructure, in Taiwan working on a luxury residential complex and an MRT project, and in sweltering Singapore building zero-energy structures. Speaking at Kajima's Tokyo headquarters, managing executive officer Shuko Yamauchi explains the benefits derived from reaching beyond Japan's shores. "We bring our energy-saving technology to other markets and promote it there. The results we develop from research in cooperation with local talent can be brought back to Japan," he says. "But Japanese corporations are venturing out not to act as the leader, but to become a platform, to smoothly facilitate synergy through collaboration with local businesses," Nobuyuki Idei says, cautioning that Japan must avoid the mindset of a conqueror. Kajima has developed such a strong presence in Asia that it now accounts for over half of the company's overseas revenues. Just 10 years ago, Europe and the United States were Kajima's biggest foreign revenue generators. Japan's shift in attitude could also be a boon for Taiwan, which has a long history of business cooperation with the Japanese. Through their competition with Samsung, Japan's big corporations experienced the importance of effective R&D, investments, and time to market, areas where Taiwan could lend a helping hand, Chiang contends. "Taiwan's speed and flexibility can help Japanese companies take their basic industrial technology and better exploit it commercially, creating a win-win situation," TIER chairman Chiang says. He cites Panasonic's solar panel and wireless charging technology and Sony's high-sensitivity CCD image sensor technology as examples of Japanese know-how that could be leveraged by the manufacturing capabilities of Taiwan's high-tech sector to create competitive niches in Asian markets. Japanese companies have long been in the doldrums, but as they now rediscover Asia, they are eagerly anticipating a striking transformation brought about by their shift in attitude.